The World's Fastest Indian is an inspirational story based on the true life of gutsy old codger Burt Munro and his dream to take part in Speed Week at the Bonneville Salt Flats in Utah with his ancient Indian scout motorcycle. Anthony Hopkins portrays Burt Munro impeccably as the quirky determined coot who defies his doctors, old age and dire financial situation to make the journey from his Invercargill shed in New Zealand, to the Bonneville Salt Flats in the USA aiming to set a land speed record. In 1967 Burt embarks on the long journey through America where he meets a plucky widow who is happy to take him in for the night and a car salesman who wants to hire him. Adamant he will not die before testing the true speed of his motorcycle on the salt flats, Burt pops Nitro pills to keep his heart going and finds a way to turn every challenge into a mission accomplished. With such gritty determination and an impenetrable will to succeed, Burt Munro is an inspirational character to both young and old. Even the ridicule of the rich fancy pants crowd with their modern flashy machines at Speed Week doesn't deter him. His diffidence, knowledge and focus eventually start to win over people as they acknowledge 'he's the real deal'. But Burt hasn't registered for Speed Week - didn't know he had too. Now officials won't allow him to test the speed of the old Indian scout. With a little help from friends he makes at Bonneville, Burt is given the go-ahead to for a safety inspection where it is discovered Burt has used kitchen parts to put his bike together and simply cut the tread off tyres to make them faster. No modern technology has been used, and the officials and fans shake their heads in disbelief. This is the kind of story that makes one wonder why Hollywood keep writing fictional scripts when there are so many real stories which are far more dramatic, intriguing and inspirational that would make amazing films. Why make up heroes when real people like Burt Munro have already paved the trail? In many ways, this film was twenty years in the making, with writer and director Roger Donaldson having first directed a short documentary about Burt Munro called Offerings to the God of Speed Donaldson's deep knowledge and understanding of Burt's character and life enabled him to create a film with many authentic layers that serve to naturally bring the story and character to life. If there is such a thing as a perfectly told engaging story, The World's Fastest Indian might just be it. Please don't read on if you can't stand spoilers. Whether Burt set a land speed record at Bonneville or not, the man is to be greatly admired. As it happens, against all odds, Burt Munro did indeed go on to time trial his motorcycle at Speed Week and wow the crowds with a land speed world record in the category of 'streamlined motorcycles under 1000 cc' that I understand has still not been broken to this day. The World's Fastest Indian is one of those 'must-see' films that tells a powerful and fascinating story that will appeal to the broadest possible audience with a range universal themes which everyone can relate too. 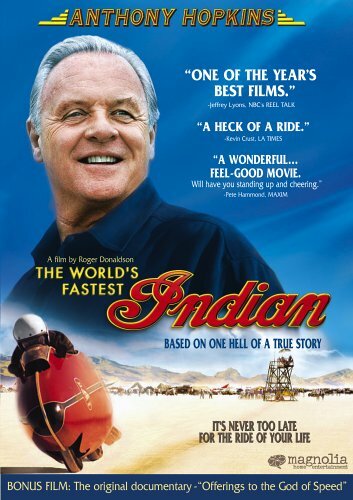 Special Note: Thank you Roger Donaldson, writer and director of The World's Fastest Indian, for making this film happen. It is a truly exceptional film that I know many people watch over and over again, including myself.